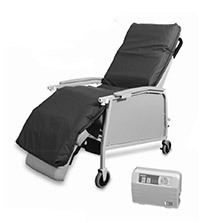 This unique alternating pressure recliner geri-chair air mattress system allows for patients who are at high risk for pressure sores to be placed in a variety of mobile devices. Patients are no longer confined to bed for the whole day due to risks of sitting without proper pressure redistribution. Alternating air recliner mattress systems can be integrated into a geriatric chair, recliner or standard high-back wheelchair. Twenty bladders gently alternate, providing low interface pressures in addition to comfortably supporting the patient. 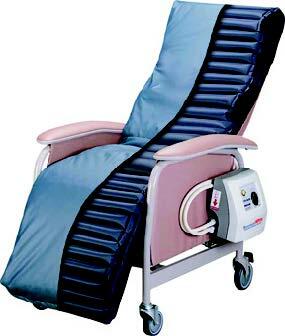 Powered alternating pressure overlay for geriatric recliners cushion. Anatomically designed with deeper cells in the torso area. Alternating pressure controller alternates inflation between A/B cells. Comfortable and waterproof top cover made of stretchable fabric. 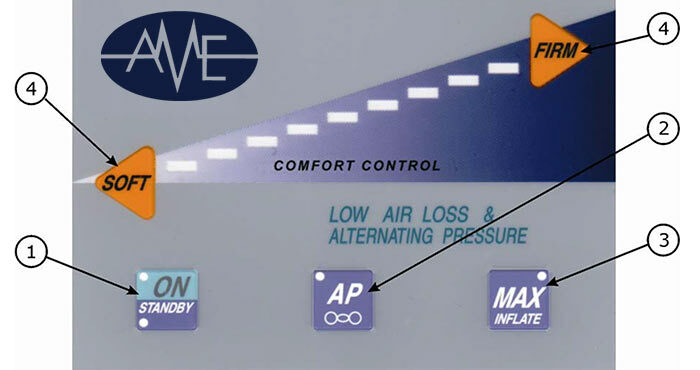 Comfort control dial to adjust firm/soft settings. Secure Air Mattress to the frame with straps provided. 2) Place control unit on the floor away from traffic. 4) Check to see that the unit is turned “off’ and then plug the unit into a grounded A/C 110 volt outlet. 5) Turn master power switch to the “on” position. 6) The Low Pressure yellow LED light indicates that the air mattress is not fully inflated. Press the Alarm Reset button to mute the alarm. When the pressure is reached, the Normal Pressure green LED will come on. Press the Alarm Reset button again to reactivate the alarm. 7) Turn the dial to the firmest position for overlay mattress inflation. The mattress will take approximately thirty minutes to air up with the pump. 8) Place the patient on the Geri-Air mattress after it is completely inflated. 9) To set comfort level, turn the dial to corresponding setting for a firm or soft mattress. 10) Press the Static/Alternate button to switch between static and alternating modes. The LED will light up in Static mode. b. Remove the hoses from the control unit. WARNING: DO NOT use this device if the power cord is cut, frayed or loosely connected to the device. WARNING: Electrically Powered Mechanism. Electrical Hazard may occur if device is plugged into inadequate electrical outlet. To avoid electrical shock hazard, make sure unit is plugged into a grounded A/C 110 Volt outlet. WARNING: DO NOT remove cover. Refer servicing to qualified service personnel. Disconnect power supply before servicing or cleaning. WARNING: Be sure to secure mattress to the frame with the straps provided. Failure to do so could result in personal injury or equipment damage. CAUTION:Overheating may cause equipment damage or failure. Monitor the unit to ensure that it functions in the proper operating temperature. CAUTION:Keep out of direct sunlight. CAUTION:DO NOT store in temperatures below 40° or greater than 95° Fahrenheit (5° – 35° Celsius). CAUTION: DO NOT expose to moisture or areas of extreme humidity. CAUTION: Ensure that strap placement does not interfere with the operation of functions. CAUTION: Electromagnetic Interference (EMI) may occur. Unit is susceptible to EMI or can cause EMI. Beware of Radio Wave Sources around the unit such as: Hand-held portable transceivers with the antenna mounted directly to the transmitting unit including citizen band (CB) radios, “walkie-talkies, security fire and police transceivers, cellular telephones and other personal communication devices. CAUTION: DO NOT use around an open flame.